Talking The Tjalk: Did Barge East Walk The Walk? Last updated 14 November 2018 . By Olivia Cheves. The De Hoop is looking pretty good for its age. At 114 the Dutch Tjalk has lived more than a little and through the efforts of three childhood friends it’s been given a new lease of life entirely. Sailed from Amsterdam to Hackney Wick, the vessel now stands moored at Sweetwater, next to the Queen Elizabeth Olympic Park, and houses Barge East. I first visited the bar and restaurant on a sweltering August afternoon when the temperature called for stuffed courgette flowers drizzled with honey, and icy espresso martinis on the deck. On this October evening I’m turning up no less sweaty, having paced it down the towpath from Haggerston, but the encroaching threat of colder weather has driven us down into the hold. You can get some of the finest canal views in Hackney Wick from the Barge East deck. 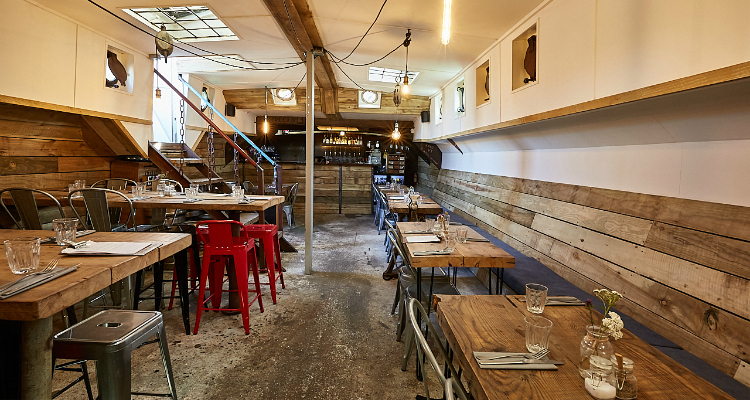 It’s small and suitably spartan down in the dining area, with a smattering of simple wooden tables along one side and some taller benches on the other. The design isn’t without thought though as careful details pay homage to the boat’s previous existence; lights are slung through pulley blocks and menus clipped to weighty metal panels. It’s a Wednesday as well, which means a folk duo has been installed by the bar to play shanty covers of pop classics to the hump day horde. One third of the team that brought De Hoop from Holland, head chef Ryan Craig cut his teeth working luxury yachts across the seven seas, and through his travels he’s crafted a menu that incorporates global flavours at every turn. Comfort food at its finest, the polenta with slow-roasted bacon and sauerkraut (£7) offers up fat, salty lardons on a bed of gloriously silky polenta, cut through by the tang of that sour cabbage. Conversely, the barbecued mussels (£7.5) are a taste of some far-off seaside escape, lolling about in their bath of lime, chilli, coconut and coriander that demands to be soaked up by hunks of sourdough. Offering a range of small and large dishes, there's international inspiration behind every plate. Similarly, the goats cheesecake mousse with plum compote, blackberry granita (£6.50) offers a tastebud-boggling dish of stunningly light mousse and sharp fruit courtesy of the compote and crunchy granita. Pretty purple shiso leaves add an extra layer of delicate anise flavour that ties a bow around the whole package in look as much as taste. 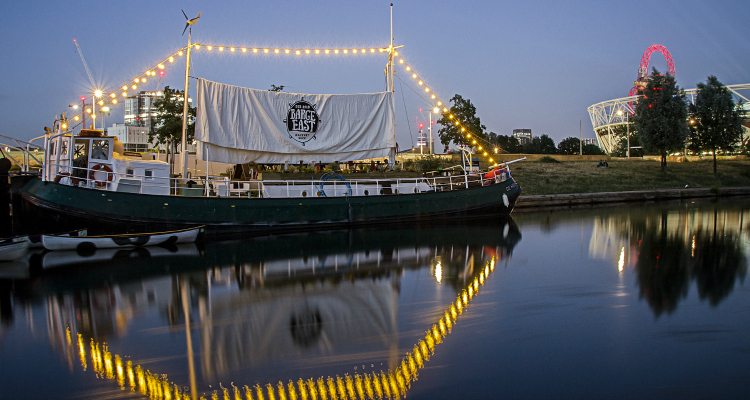 A boat for all seasons, Barge East is perfect for on-deck dining in summer and cosying up downstairs in winter. An absolute delight of a venue, Barge East offers an atmosphere as good as its food - and the food here is very good. 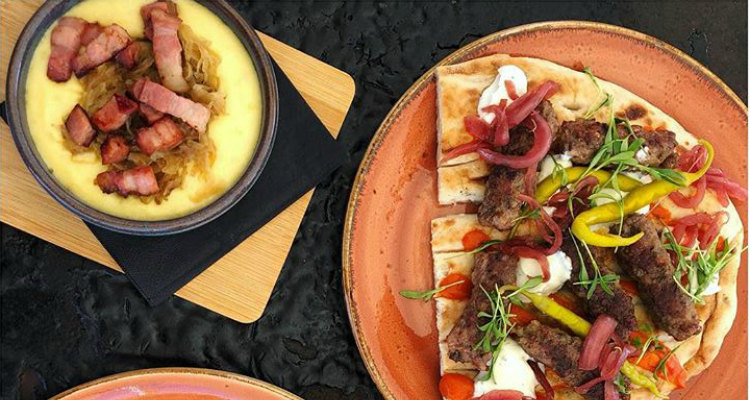 Boasting an interesting mix of internationally-inspired dishes, each plate is perfectly executed by chef Ryan Craig, blending flavour, style and satisfaction across a small but well-crafted menu.